Looking for a super sleek and effective design in your pedestal fan? 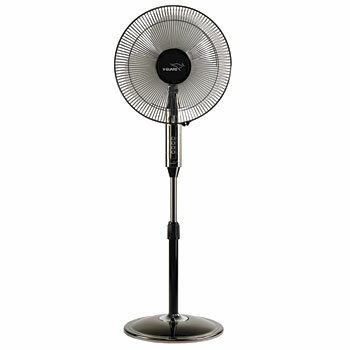 Here's the V-Guard Chrom Max DX, a sleek pedestal fan is a stylish new fan that will keep your home cool in the summer. It features a swanky and stylishly designed chassis that is extremely slim. Featuring three different speed settings, the V-Guard pedestal fan is versatile enough to be used anywhere in the home. The V-Guard pedestal fan also has wider oscillation so that every corner of the room receives air in a uniform manner. This V-Guard 55 watt pedestal fan is an economical way to cool your room considering high power costs. Thanks to its sleek design, it can easily be accommodated anywhere in the room. It is neither bulky nor noisy. In fact, it operates in silent mode, not even making you feel its presence in the room. The fan looks attractive in its body and adds to the beauty of your home while keeping it cool.